ant to know how to migrate emails from MDaemon to Outlook? 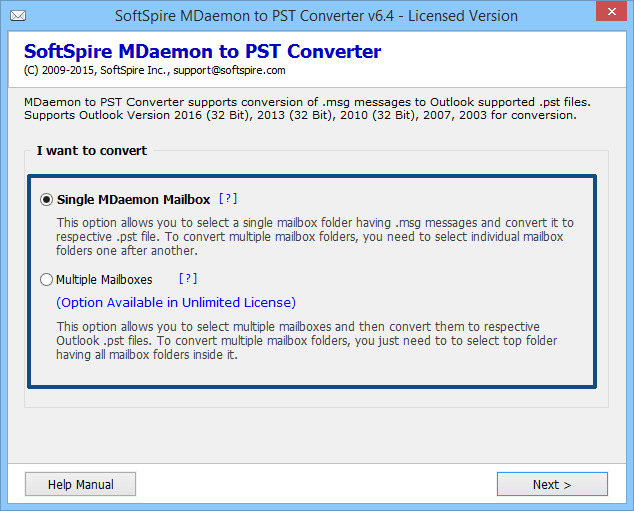 Get MDaemon Converter, a smart program that supports to migrate emails from MDaemon to Outlook with 100% output. The software, with its simple steps, allows even layman users to easily handle it to convert MDaemon data files to Outlook. No technical training is required to use this software and anyone can use it to convert MDaemon database to Outlook. The software’s working is not dependent upon any other application and works smoothly even if there is no MDaemon installed on the system and effortlessly migrate emails from MDaemon to Outlook 2016, 2013, 2010, 2007, 2003. Free demo of MDaemon to Outlook migration tool provides its complete evaluation process and also allows MDaemon database to Outlook migration, but with a watermark “DEMO” at all the emails. To migrate emails from MDaemon to Outlook without the watermark, purchase the licensed edition of the software only at 99 USD.